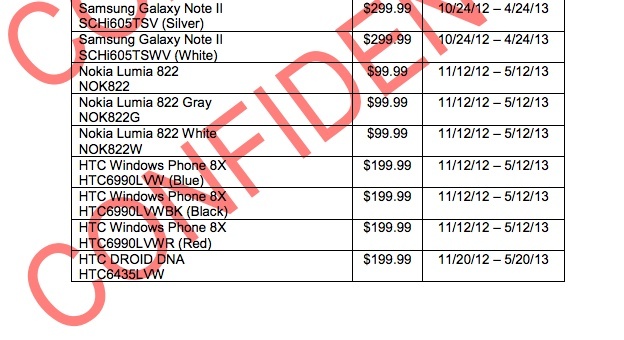 HTC DLX to Launch as the HTC DROID DNA for $199 in Mid-November? What’s even more interesting than the name, is the price that Big Red has listed. How does $199 on 2-year contract sound for a device with an industry leading 1080p display? The DROID DNA should also sport a quad-core Snapdragon S4 Pro processor, 16GB of internal storage, 2GB RAM, 8MP camera, and run Jelly Bean. By all means, this is one of the most high-end devices we have seen in some time, and is at a level that Verizon usually attaches to a premium $299 price. The first photos of this device appeared over the weekend, showing one of the sexier Android devices of the last year. A November release matches up to what our sources have been whispering into our inbox over the last few weeks. On a related note, the Galaxy Note 2 is appearing on this list as well, with a $299 price tag and a potential launch of, today. We know that it isn’t launching today, but our sources mentioned yesterday that the device could go up for pre-order as early as tomorrow.